Turkmenistan (also known as Turkmenia) is a country in Central Asia. The name Turkmenistan is derived from Persian, meaning "land of the Turkmen". Before 1991, it was a constituent republic of the Soviet Union, called the Turkmen Soviet Socialist Republic. It is bordered by Afghanistan to the southeast, Iran to the southwest, Uzbekistan to the northeast, Kazakhstan to the northwest, and the Caspian Sea to the west. Although the country is wealthy in natural resources in certain areas, most of it is covered by the Karakum (Black Sands) Desert. Turkmenistan has a single-party system ruled by President for Life Saparmurat Niyazov. The territory of Turkmenistan has a long and checkered history, as armies from one empire to another decamped on their way to more prosperous territories. Alexander the Great conquered the territory in the 4th century B.C. on his way to India. One hundred and fifty years later Persia's Parthian Kingdom established its capital in Nisa, an area now located in the suburbs of the modern-day capital of Ashgabat. In the 7th century A.D. Arabs conquered this region, bringing with them Islam and incorporating the Turkmen into Middle Eastern culture. It was around this time that the famous Silk Road was established as a major trading route between Asia and Europe. The Turkmenistan region soon came to be known as the capital of Greater Khorasan when the caliph Al-Ma'mun moved his capital to Merv. In the middle of the 11th century, the Turks of the Seljuk Empire concentrated their strength in the territory of Turkmenistan in an attempt to expand into Afghanistan. The empire broke down in the second half of the 12th century, and the Turkmen lost their independence when Genghis Khan took control of the eastern Caspian Sea region on his march west. For the next seven centuries, the Turkmen people lived under various empires and fought constant intertribal wars. Little is documented of Turkmen history prior to Russian engagement. However, from the 13th to the 16th centuries, Turkmen formed a distinct entholinguistic group. 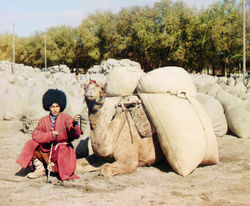 As the Turkmen migrated from the area around the Mangishlak peninsula in contemporary Kazakhstan toward the Iranian border region and Amu Darya river basin, tribal Turkmen society further developed cultural traditions that would become the foundation of Turkmen national consciousness. Between the 17th and 19th centuries, control of Turkmenistan was fought over by Persian shahs, Khivan khans, the emirs of Bukhara and the rulers of Afghanistan. 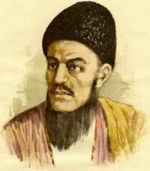 During this period, Turkmen spiritual leader, Magtymguly Pyragy reached prominence with his efforts to secure independence and autonomy for his people. Still, at this time, the vast territory of Central Asia, including the region of Turkmenistan was largely unmapped and virtually unknown to Europe and the Western world. Rivalry for control of the area between the British Empire and Tsarist Russia led to the establishment of The Great Game. Throughout their conquest of Central Asia, the Russians were met with the stiffest resistance by the Turkmen. By 1894, however, Russia had gained control of Turkmenistan and incorporated it into its empire. The rivalry officially concluded with the Anglo-Russian Convention of 1907. Slowly, Russian and European cultures were introduced to the area. This was evident in the architecture of the newly-formed city of Aşgabat which was to be the country's capital. The October Revolution of 1917 in Russia and subsequent political unrest led to the declaration of the area as one of the 15 republics of the Soviet Union in 1924. Thus, the modern borders of Turkmenistan were formed. The new Turkmen Soviet Socialist Republic went through a process of further Europeanisation. The tribal Turkmen people were encouraged to become secular and adopt Western-style clothing. The Turkmen alphabet was changed from the traditional Arabic script to Latin and finally to Cyrillic. However, bringing the Turkmens to abandon their previous nomadic ways in favour of communism was not fully embraced until as late as 1948. Nationalist organizations in the region also existed during the 1920s and the 1930s. When the Soviet Union began to collapse, Turkmenistan and the rest of the Central Asian states heavily favored maintaining a reformed version of the state; mainly because they needed the economic power and common markets of the Soviet Union to prosper. However, in 1991 the Soviet Union split and Turkmenistan was one of the last countries to declare its independence. The former Soviet leader, Saparmurat Niyazov, remains in power to this day. His policies have changed greatly since Soviet times: He is friendly to foreign corporations; he has rather tense relations with Moscow; and he styles himself a promoter of traditional, Muslim, Turkmen culture. However, the extent of his power has been greatly enhanced since the early 1990s. An authoritarian dictator, he refers to himself as "Turkmenbashi" – a title which means "leader of all ethnic Turkmen", in a similar style to Mustafa Kemal Atatürk. He has become notorious in the Western world for his cult of personality and the disproportionate measures he takes to crush political dissent. Presently, 60% of the population is unemployed while 58% lives below the poverty line. 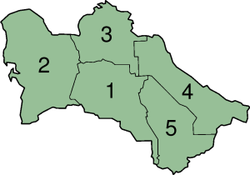 Politics of Turkmenistan take place in the framework of a presidential republic, whereby the President of Turkmenistan is both head of state and head of government. Turkmenistan has a single-party system ruled by President for Life Saparmurat Niyazov. Human rights issues in Turkmenistan, an authoritarian state, include freedom of religion issues. According to Forum 18, despite international pressure, the authorities keep a very close eye on all religious groups and the legal framework is so constrictive that many prefer to exist underground rather than have to pass through all the official processes, which act as barriers. Protestant Christian adherents are affected, in addition to groups such as Jehovah's Witnesses and Hare Krishna. The Hare Krishna are not allowed to seek donations at the country's main airport, the Ashgabat Airport. According to the 2005 Reporters Without Borders World Press Freedom Index, Turkmenistan had the 2nd worst press freedom conditions in the world behind North Korea, and as of a 2006 report, is listed as one of the 13 "Internet enemies", calling President Separmurad Nyazov a "central Asian Kim Jong-Il." In early 2005, the Turkmen President called for all hospitals outside the capital Ashgabat to be closed. Given the restrictions on movement inside the country and the country’s tightly controlled press, outside experts have had difficulty in determining the extent to which the hospital-closing plan has been carried out. At 188,457 mi² (488,100 km²), Turkmenistan is the world's 52nd-largest country (after Spain). It is comparable in size to Cameroon, and somewhat larger than the US state of California. Some 90 percent of the country is covered by the Karakum Desert. The centre of the country is dominated by Turan Depression and the Karakum Desert which are mostly flatlands. The Kopet Dag Range, along the southwestern border, reaches 2,912 meters (9,553 ft). The Turkmen Balkan Mountains in the far west and the Kugitang Range in the far east are the only other appreciable elevations. Rivers include the Amu Darya, Murgap, and the Hari Rud. 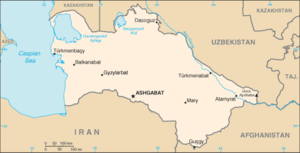 Other cities include: Turkmenbashi (formerly Krasnovodsk) and Dashoguz. One-half of its irrigated land is planted in cotton, making it the world's 10th-largest producer; and it possesses the world's fourth-largest reserves of natural gas as well as substantial oil resources. In 1994, Russia's refusal to export Turkmen gas to hard currency markets and mounting debts of its major customers in the former Soviet Union for gas deliveries contributed to a sharp fall in industrial production and caused the budget to shift from a surplus to a slight deficit. Turkmenistan has taken a cautious approach to economic reform, hoping to use gas and cotton sales to sustain its inefficient economy. Privatization goals remain limited. Between 1998 and 2002, Turkmenistan has suffered from the continued lack of adequate export routes for natural gas and from obligations on extensive short-term external debt. At the same time, however, the value of total exports has risen sharply because of higher international oil and gas prices. Economic prospects in the near future are discouraging because of widespread internal poverty and the burden of foreign debt. President Niyazov has squandered much of his country's revenue on self-glorification, with cities, Ashgabat in particular, being given extensive renovations whilst the people living outside the capital struggle in conditions of poverty. 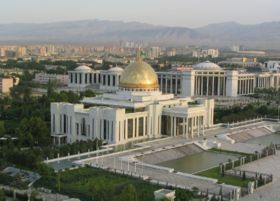 Particular concern has been voiced by corruption watchdogs over the management of Turkmenistan's currency reserves, most of which seem to be held in off-budget funds such as the Foreign Exchange Reserve Fund in Deutsche Bank Frankfurt, according to a report released in April 2006 by London-based NGO Global Witness. President Niyazov has pledged free water, electricity and gas; however, shortages are frequent. On September 5, 2006, after Turkmenistan threatened to cut off supplies, Russia agreed to significantly raise the price it pays for Turkmen natural gas, from $65 to $100 per 1,000 cubic meters. Two thirds of Turkmen gas goes through the Russian state-owned Gazprom. The majority of Turkmenistan's citizens are ethnic Turkmen with sizeable minorities of Russians and Uzbeks. Smaller minorities include Ukrainians, Kazakhs, Azeris, Armenians and Tatars. Turkmen is the official language of Turkmenistan, though Russian still is widely spoken as a "language of inter-ethnic communication" (per the 1992 Constitution). The name Turkmen, both for the people and for the nation itself, is said to be self-referential from the period the Russians first encountered the people, parsing as Tūrk-men, or "I am Tūrk". Education is universal and mandatory through the secondary level, the total duration of which was recently reduced from 11 to 9 years.